Our Classic JUMBO is the largest body bag we've ever produced. Manufactured using a heavy gauge polyethylene material with a polyester laminate, our Classic JUMBO has unmatched strength, certified to carry up to 3500 lbs down six flights of stairs. Measured at 54"x 98" this bag also features reinforced handles for a lift team up to eight. Heavy duty zippers and unbreakable straps and membrane will reward you with performance under extreme conditions. Our Classic JUMBO is PVC-free and meets all requirements for cremation. Our JUMBO is a tool in increasing demand at a lower price point than our competitors' heavy duty body bags. 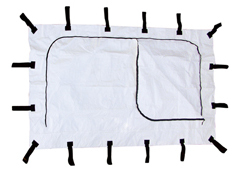 Primary Application: Crematoriums primarily use our jumbo body bags because they are chlorine free and burnable. These bags have a large weight capacity so they are perfect for moving heavier bodies and are also sometimes used by medical transport companies.